I forgot to post this, but the other week I went out for coffee with my friend Angela, who is living here for 4 weeks. We went to this Italian bakery that our friend Leana had highly recommended. And I must say, it was yummy to boot! Unfortunately it was not a baby-friendly place. So boo erns to that. 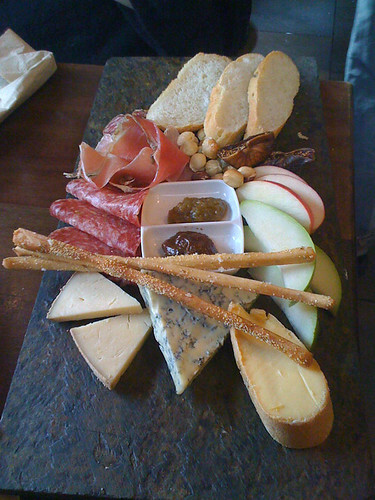 I had ordered an Americano and a plate of eye-pleasing and equally mouth-pleasing cookies (which I forgot to take a photo of), which Angela had drip coffee and shared with me the antipasti plate that was on special (that, I did take a photo of, which is shown below). The plate was so good that I had to share it and make a post about it. I would love to go back, but maybe when I can find a sitter or when the little one is a little bit older. oooh that spread looks delicious! I love stinky cheese. I normally don't like stinky cheese...but this place sure made it easy to like it! I can't believe I even ate the stinky cheese that was on the plate! !